"I have to suspect everyone. My recurring nightmare is one day I might have to arrest meself." After a hiatus of six years, The Avengers returned to the small screen with Patrick Macnee back in the harness as John Steed. But his supporting cast was quite different: instead of one partner, he now had two, a man and a woman, Mike Gambit (Gareth Hunt) and Purdey (Joanna Lumley). I don't believe there was ever any indication as to whether Purdey was her first or last name or both. The series returned with a much larger budget, permitting some location shooting and effects work that was impossible in the earlier series, including copious explosions. The basic setup is still the same: Steed and his associates take on secret agents and bizarre criminals who threaten Britain, if not the world. Although some of the whimsy of the earlier programs was retained, things tend to be much more serious in this incarnation, a reflection that the swinging 60s were long gone and that we were deep into the grimy 70s. The sexual innuendo, bubbling beneath the surface back in the Emma Peel days, is ratcheted up a couple notches, especially between Gambit and Purdey, though we find out a bit more about Steed's personal life as well. 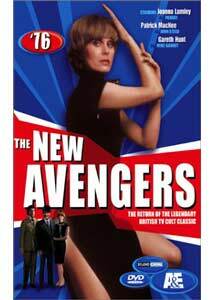 This new release from A&E includes all 13 episodes from the first of two seasons of The New Avengers. As usual, the new series dispenses with any introductions or explanations of any kind. Instead, we're plunged directly into a bizarre scheme involving monks on a Scottish isle, an abducted cryogenics scientist (Peter Cushing, last seen back in the Emma Peel episode Return of the Cybernauts), and a bunch of refugee Nazis. One doesn't have to be a cryogenics scientist to guess what's going on here, but there are plenty of odd quirks, including the use of fishing poles as deadly weapons. The series is still finding its way, and Gambit's action scenes are mostly fudged with camera work, giving the production a bit of a cheap air despite the good sets and otherwise high production values. This would be only a 3-martini episode, if not for a nicely ironic ending that boosts it a little bit. Gambit: "Purdey, I wanted him alive!" Purdey: "Difficult decision. Him or you." Professor Turner (David Swift) is obsessed with gold, and has concluded the best way to obtain it is through marketing biological weapons to the highest bidder. In a storyline that's chillingly up-to-date, Steed and company must deal with Midas (Giles Millinaire), whose touch can impart nearly every deadly disease known to man. This episode, directed by Robert Fuest, sparkles with visual bric-a-brac and high camp flavor. Particularly striking is Midas' appearance as the Red Death, recalling Chaney's Phantom of the Opera (1925). There are even some Tarantino-like moments where Gambit and Purdey discuss Treasure of the Sierra Madre during a wild car chase. A terrific episode, one of the best since Diana Rigg left the series. Steed: "I don't have a teddy bear in my bed." Gambit: "He keeps it in a safe with his other valuables." The cinematic motif reappears in this third episode, which borrows very liberally from The Manchurian Candidate (1962). Russian agent Perov (Peter Jeffrey, another Avengers regular) fakes his death after a defector gets away from him. Once safely dead, Perov sends out half-playing cards to various sleeper agents who become mindless killers. Among them are friends of the Avengers. There's a very funny sequence where Steed ostensibly describes his past partners. Purdey gets the first really steamy sequence as she performs a striptease in a risque bit. The character development introduces a recurrent theme of distrust within the MI5/MI6 organization that will surface again. Good for three martinis, with some reduction for its derivative nature. Kane (Robert Lang): "I hope you have a strong stomach." Poor Emma Peel had to deal with the Cybernauts twice, and they're not done yet. This outing was written by Brian Clemens instead of Phillip Levene, who penned the first two. The third installment in the trilogy finds Frank Goff (Robert Gillespie), the assistant of Dr. Armstrong, who developed the Cybernauts, being released from prison. Yes, there's been time for a ten years' sentence since the first appearance of these robotic killers. Goff is recruited by the horribly burned double agent Kane (Robert Lang) to find the warehouse (!) full of Cybernauts. With the help of cybernetics expert Professor Mason (Basil Hopkins), Kane intends to create a Cybernaut body for himself and wreak his vengeance upon the Avengers. There are too many familiar concepts here, including the usual blackmailed scientist, to prevent any significant number of martinis to be awarded. Steed:"You're supposed to be spying on them, not on me." Back in the mists of time during the mostly-lost first season of The Avengers, Steed was paired with Dr. Keel (Ian Hendry). In a nifty turn 16 years later, Ian Hendry returns as Irwin Gunner... an agent who has a memory lapse of 16 years! It's never clear whether he's really supposed to be Keel, but that certainly seems possible, considering Gunner is a trapeze artist and Keel had spent time with a circus (as had Hendry himself). In any event, Gunner's memory slowly begins to return after a blow to the head, and he recalls that he was after a mole within the organization known as the White Rat. It's up to Steed and company to find him and learn what he knows before the White Rat himself can eliminate Gunner. There are a ton of red herrings here, making for a masterful mystery that keeps the viewer guessing. Purdey also gets some good digs in on Gambit, who is becoming increasingly annoying. Good for four martinis for the dedicated series fan who knows series' history. Steed: "I suppose you think I'm the real Steed. This umbrella is loaded." This episode rather echoes the goofier moments of the Emma Peel period, with a bizarre murder m.o. providing most of the intrigue. Zarcadi (Vladek Sheybal) is a falconer and bird trainer who uses his feathered friends to commit homicide. We know early on who is doing the deed, and most of the interest comes from following the Avengers as they try to piece the crime together (or indeed, to demonstrate that any crime has been committed at all). The use of eco-terrorism as a motivating factor almost makes this episode an indictment of Greenpeace, which had been founded five years earlier. Director John Hough makes use of some Hitchcockian angles to give this a bit of visual interest, but for the most part it's pretty much by the numbers and less than fascinating. Two martinis it is. Purdey: "What girl could sleep through two men bursting into her bedroom?" Five top agents drop dead, apparently of natural causes. The common factor is that they all are on or about to go on leave. A training facility like a live first-person-shooter game figures prominently in the mix, and we learn that only Steed has ever passed with a perfect score. There's some good suspense in the finale as Gambit must make his way through the target range, with Steed and Purdey's lives on the line. Quite well done indeed and worth four libations. Purdey: "They think I'm not me. But I am me. Gambit's dead. Dead! I think Steed's a fake too." This episode anticipates Face/Off by featuring substitutions of prominent people with surgically altered tramps under the control of Dr. Prator (David De Keyser). When one suddenly has a coronary and is revealed to lack certain distinguishing features, the plan begins to unravel, and Gambit goes underground to find out what's happening. The adventure is a bit reminiscent of the classic Emma Peel episode Who's Who, but without the lighthearted character. Too many plot holes and improbabilities keep this one at three martinis. Purdey: "I thought about it, as my bike cartwheeled and I flew through the air and smashed my head against a tree trunk. I thought about it. And then I forgot." This engaging caper episode features the mystery of Burt Braden (George Cooper), just released from prison, who retrieves a piece of evidence from a well. A pair of criminals, sensing fortune, kill him, but the evidence is nowhere to be found. They follow Braden's tracks, as do Steed, Purdey and Gambit, leading them through cropdusting, phony antiques and trashy paperback novels. This episode features a particularly prominent laid-back jazz score that helps make it an enjoyable spree worth three and a half martinis. Juventor (David Greif): "With this device I can obtain for you the unobtainable, and the unobtainable is cheap at any price." The theme of changing identities crops up yet again in this brain-transference story. The stammering villain Juventor (David Greif) steals a mechanism that transfers thoughts and physical abilities, and he demonstrates its usefulness for the Russians using a tap dancer! Using the mechanism, Juventor goes after the Three Handed Game, a secret that reveals American plans in the event of war. There's quite a bit of humor here, particularly the tap dancing theme, which recurs throughout (and culminates in a display of tap from the leggy Purdey). Most entertaining is the use of tap to demonstrate the reasserting personalities of those whose minds have been taken over. Greif makes for a great villain, though the stammer device to indicate his presence in other bodies is a bit obvious. Three and a half martinis. Brady (Keith Buckley): "Cover your face. The city's asleep, but the closed-circuit cameras are not." Dr. Graham (Arthur Dignam) has invented a dust, S-95, which makes anyone breathing it fall instantly into a deep sleep. The Avengers witness a test and are inoculated against it. But master criminal Brady (Keith Buckley) swipes the S-95 and uses it to put the entire city of London north of the Thames to sleep so that his gang can loot at will. With the phone lines cut (screenplay writing was so much simpler in pre-cell phone days), the Avengers must find a way to foil the well-armed gang. An amusing and well-done episode reminiscent of the paralyzed city in Ren� Clair's The Crazy Ray. Four martinis. Carter (Peter Cellier): "Have you considered it might be female? What if it breeds?" Scientists working on a growth formula accidentally dump some down the drain, and before long gigantic creatures in the sewer, grown ravenous, begin killing at will. Much of this episode takes place in the darkness of the sewers and is exceptionally hard to make out. The effects are decent (the darkness assuredly helps), and the suspense factor works well. Then-supermodel Anulka Dziubinska has a small role too. Worth three libations. Purdey: "What do you want me to do? And I warn you, it's not my day for risque answers." The Avengers are looking for the vanished General Stevens, who has been captured by troops who seem to be taking their war games a little too seriously. Their commander, Col. "Mad Jack" Miller (John Castle) turns out to have converted his commando unit into a private army of his own and must be stopped. Perhaps the most interesting facet is Miller's motivation, that a peacetime military is lacking in discipline and that to maintain proper fighting skills, acting in real wars is essential, even if it means turning mercenary. A passable entry in the series, with an ending featuring Purdey on a helicopter rope ladder (drinking champagne) that recalls the first Emma Peel season tag sequences as unusual conveyances took the pair away. A mediocre finale to the set, worth two and a half libations. Image Transfer Review: The full frame transfer is generally quite pleasing. Color is excellent and vivid, unlike the often washed-out appearance when these programs air on television. There is some random speckling throughout, but that's the primary a source material defect. Though the program was transferred from PAL to NTSC, the telltale ghosting that often plagues such conversions is happily nominal and visible only on close inspection of still frames. I never found it intrusive during actual play of the episodes. The picture tends to be somewhat on the soft side. The main issue I had is that some segments are excessively dark, such as Gnaws, though that may have been intentional to hide shortcomings in the effects work. Blacks are deep and solid, especially for 1970s television. Audio Transfer Review: The audio is nominally 2.0 stereo, but seems to decode as mono. The theme music has an impressive quantity of bass to it, though the frequent explosions lack oomph. The audio is generally clean and clear, without notable hiss or noise. The sound is about as good as one can reasonably expect for television of this period. Extras Review: The sole extra is the usual set of stills, three for each episode. As usual, the stills fill less than half of the screen, making detail unnecessarily hard to make out. The chapter lengths seem rather uneven, with many running over 15 minutes. More stops would have been welcome. One of the great British series of the 1960s returns with a 1970s attitude. While Steed is in fine form and Purdey is a welcome addition, Mike Gambit is rather stiff and uninteresting. The episodes range from passable to quite good as the crew finds a proper tone for the new incarnation. The discs look and sound quite good, though as usual there's precious little in terms of extras.